What should you know before buying a beach house? Home » What should you know before buying a beach house? Are you tired of the constant cold weather in your area? Do you want to have a house that is in a warmer area, next to a beach? Then you should consider buying a beach house! Having a beach house has very many benefits as we will state in this article. However, you need to know all the drawbacks as well. Now let’s see what you need to know before buying a beach house, or a better way to put it, your new vacation home! Having a beach house is everyone’s dream. What are you waiting for? Buying a beach house is a great investment opportunity. By buying a beach house you are paving the way to renting it for hot summer months, and when all the monetary gains add up, you can live in the housing off-season basically for free! Though this sounds easy enough, there are some things you need to pay attention to. You NEED to find a good real estate agent, who is proficient in working with coastal areas. This way you can find the best option. By having an experienced professional in the field searching for your new beach house, you will minimize the risk of buying a beach house and then regretting it because of different reasons. Some of these reasons are the weather, the durability of your house, mortgage rates, house insurance among other things. We will now talk about important things to consider when venturing in! You have to see what the weather is like during the off-season. During summer it will most probably be scorching hot, and no weather-related incidents can happen. This is why moving companies in Miami suggest that this is the best time to move to the beach house. But during the off-season, you will have to pay attention to different climatic changes occurring in the area. You need to see if the foundation of your new house is compatible with the weather. If the area is prone to flooding or landslides, you should consider buying a house built on stilts. They will ensure that the flood does not reach the inside of the house and cause a lot of damage. You should also consider buying a beach house made of concrete, as the wooden framed ones are a lot less durable, and are prone to succumbing to the wind. Make sure you have a house with stilts to avoid flood damage. Another thing you should pay attention to is the roof. Some houses may have very old roofs which you will probably need to renovate so it can survive the climatic changes occurring during the year. Renovating a roof costs somewhere between $20.000 and $30.000 which is not cheap at all. In order to avoid this, you should find a house with a relatively new roof. This will ensure that you do not have to spend money on renovating it, at least not in the first few years of buying a beach house. Another thing to consider is to get a house with a metal roof. These types of roofs are very resistant to wind and will be your best bet against the changing weather. This is vital to sustaining the home in the off season. By having good enforced windows, you will not have to worry about the damage done by strong winds and hurricanes. This is also a great way to keep the energy flow in your house stable, as the heat will not slip out of your house through unreliable window openings. This is maybe the most important thing when it comes to buying a beach house. You always want to be as close as possible to the water when trying to find a suitable vacation hotel or motel, so why would this be an exception. This will even increase the popularity of your house, and maybe increase the rent price for potential tourists. However, there are some things you need to take into account when considering this. Risk of flooding is an important factor and you should find a house which is flood proof. Another thing is the insurance rate. It will surely increase the closer you get to the water. Keep this in mind when thinking about this aspect. If you do not live in the same town where your beach house is, this can create a myriad of problems. What if something important, such as kitchen appliances, or an air conditioner, breaks down? If you cannot live in the house during the renting season, you should consider hiring long distance movers in Miami, to help you move the furniture you want to fill your new beach house with. If you cannot do so, you will need to hire a property manager. This way you will always have someone who you know you can trust in charge of your house. However, property managers can be expensive, and the better they are, the more expensive they will get, logically. So, consider this option and check your financial status before diving in head-first and regretting it afterward. This is a very important thing to keep in mind and research because the interest rates can be surprisingly high. A yearly rate of about $10.000 (if you are lucky) is about the cheapest it can get. And it will only get higher, because of the many recent flooding and hurricanes on the east coast. Consider your options with your insurance agent, and do not be afraid to extend your search range. Some insurance companies cover more while costing less. You never know what you may stumble upon! 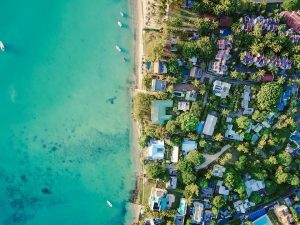 Whether you are buying a beach house so you can rent it, or buying it as your new primary residence, you need to make sure everything checks out. This can be a new beginning if done correctly and a dream come true for many people. Having a summer “getaway” house is one of those things everyone wishes. So, take it slowly, do not rush anything, consider every option, and enjoy your new house! Beach houses, warm weather, what more could you wish for?